It's been almost a full month since the box office story was about anything other than Black Panther. As it gets set to cross the $600 million threshold, the story is still mostly about it, but it's getting ever closer to not being so. The main opposition to this is a reboot of the Tomb Raider franchise, based on the action-adventure video game known for having one of the more prominent female characters in the genre. The original movies starred Angelina Jolie and corresponded largely to the well... rounded character but which suffered from overstuffed and idiotic plotting. 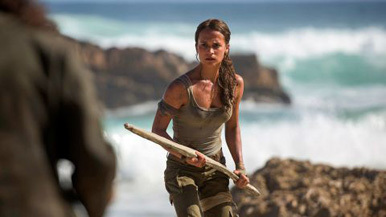 This reboot falls in line with the toned-down and grittier take of itself-rebooted video game series and stars Alicia Vikander as Lara Croft. This version covers similar ground to the first albeit in a slightly more grounded fashion as Croft sets out in search of information about her deceased father's disappearance and keeping up with the family business of raiding tombs. Into the South Pacific she goes, and uncovers a conspiracy about a former compatriot of his (Walton Goggins) and a prophecy about an ancient plague that the secret society he belongs to aims to release. Cue some Indiana-Jones-lite level action, including a bunch of scenes that seem to rely on Quicktime events and jumping puzzles. As directed by Roar Uthaug (how is that a real name?) it feels pretty generic despite the video game connection. Problematic for it is that the original franchise died rather hard, and tarnished it as a movie brand (though people sat through five objectively terrible Transformers films before crying uncle, go figure). The film's ad campaign has also gone on for a very long time without showing any remarkable footage, probably leading many to think this has come out a long time ago. There is definitely such a thing as too much lead time, and Tomb Raider has fallen victim to it. I'd expect a mediocre weekend of around $22 million for its debut. Young adult drama gets handled this weekend by Love, Simon, an adaptation of a best-selling novel about a popular high school student who is harboring a secret – he believes he's the only gay student in his school. An anonymous self-outing of another student puts him on the hunt for the identity of the mystery teen, all the while trying to stay in the closet himself, on the principle that it's his decision to make, on his own terms, in his own time. Eventually though, all is revealed and the challenge becomes dealing with the social and family fallout while still just wanting to be a normal teenager. Directed by Greg Berlanti, best known for being show runner for a whole bunch of DC TV projects and starring Nick Robinson (the older teen in Jurassic World), Katherine Langford, the lead, posthumous character (I know what I said) in the Netflix hit 13 Reasons Why, along with Jennifer Garner and Josh Duhamel as his parents, it's a charming looking little film that has more than a hint of John Hughes in it. Reviews are pretty strong, which could elevate it beyond the usual teen fare, though maybe not to, like, John Green movie levels. I'd expect about $11 million here. I Can Only Imagine is the mostly autobiographical story of musician Bart Millard, his band MercyMe and their biggest hit song, which is probably a bit of an unknown if you're not on the in with Christian music. J. Michael Finley plays the lead role, exploring his growth in music as he escaped a terrible home life (an abusive father played by Dennis Quaid) and abandonment issues with his mother. Opening in 1,600 venues, this is very much a niche picture, and should land with about $4 million. Opening in national release is 7 Days in Entebbe, the story of a 1976 hijacking of an Air France flight from Tel Aviv, with the goal of holding the Israeli citizens hostage to secure the release of a group of Palestinian prisoners. The flight was taken to Uganda, with the express support of then dictator Idi Amin. This film deals with the rescue operation launched by the Israeli government which freed all but three of the hostages. Starring Rosamund Pike and Daniel Bruhl, and directed by Jose Padilha of Narcos fame, this should open to about $3 million. For a fifth straight weekend, Black Panther should be the winner of the box office chart. Narrowly holding off A Wrinkle in Time last weekend, it should do the same to Tomb Raider this one, as its typical drops so far would put it at about $24 million for the frame. It's on the verge of catching The Last Jedi's $619 million from last weekend, and still has a good chance at hitting third all time. Its international totals are also incredibly impressive, with $1.1 billion brought in so far, with $1.5 billion possibly in the cards. A Wrinkle in Time opened to $33 million, which is a solid figure for a YA aimed sci-fi film, but which had the misfortune to have a budget of over $100 million, making profitability a bit of a struggle. International figures could help this and word of mouth is pretty good, but I'd still file this as a mild disappointment. Its second weekend should bring about $17 million. The Strangers: Prey at Night was a major fall off from its original film, having left it far too long for a sequel. This should drop steeply from its $10.4 million opening weekend, to just a bit over $5 million. One more film sits in relevant territory, Game Night, which has shown a decent amount of legs off its twisty comic premise, and should earn about $5 million more this weekend, on its way to around $60 million domestic.